I made this as trade for a 5 hp powermatic taple saw for my new shop. Solid and veneer sapelle, solid wood fronts and drawer boxes. The ends I used poplar bending ply with 1/16” thick veneer front and back. I enjoyed this project. Looks great. I really like using that poplar bending ply, works really well for curved panels. wow spectacular,love the design and choice of wood on this.i think hes getting the better end of this deal.welcome to lumber jocks,ill be looking for more from you. Beautiful i agree wit Potts. Wow did you joined the curved ends to the legs? Did you make the veneer? No, I didn’t make the veneer. A friend of mine ordered a sapelle tree veneered to 1/10th sequenced and labeled, I used a couple flinches of his. It matched my solid wood very well. I have an 18” band saw for veneering but free perfect veneer isn’t something I’d turn down. My ends were dadoed 1/2” into the legs full length of the panel then finished the bottom with a moulding I carried through the visible face and ends. The saw was worth the trade. This is the only other pic I took of this project. 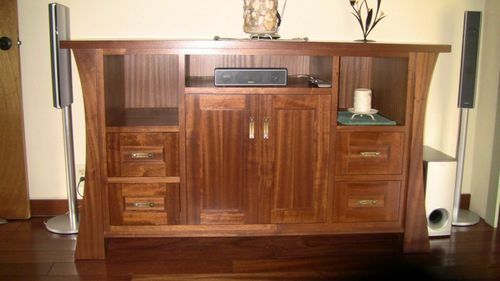 This is a very attractive media cabinet. Nice work!